I went to a Catholic elementary school and all-girls Catholic high school so needless to say, I had been wearing a uniform until I was eighteen. The only way to express myself was through haircuts, jewelry, backpacks and shoes. I would occasionally throw on the "illegal" tights or sweaters but it was not like the looks we see on Gossip Girl. Every fall and spring, I would look forward to picking out my new pair of shoes to show everyone at school my style. 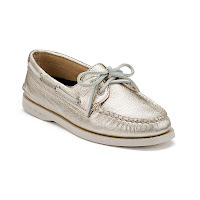 In my earlier years, I always chose the original Sperry Top-Sider. I loved the classic look and no one else at school had these. The best part was tying the strings into the curly cue or barrel at the sides making the boat shoe a slip on. I recently ignited my love for Sperry's as my boyfriend came home wearing a navy pair he found one day. For me, the originals will always be my favorite but I stumbled upon the new limited edition for Jeffrey New York. Sperry created this special edition style for women to take the "Authentic Original" to another new level. Created in five neon patent-leather colors, these are only around for a short time making them even hotter. The prices range from $85-$125.00. Currently, I am obsessed with these metallic, platinum gold numbers. The little boat imprint lets you know it's a Sperry!